Did you know you can recycle egg shells and use them to make children's crafts. But before you use them you have to make sure they are cleaned properly with soap and water. Eggs have a beautiful protective coating surrounding them and I'm very thankful for that. Otherwise eggs would be pretty messy to deal with. Could you imagine opening your egg carton and each cup was filled with egg fillings, without the egg shell? I'm thankful for that beautiful shell. All bird's lay eggs, but we usually only eat the chicken egg in America. The chicken egg shells are usually tan or white, depending on which chicken laid the egg. The egg shell is a pretty great craft item, especially for beautiful mosaics. Find out what other crafts you can make with egg shells below. Children can grow beautiful flowers in them or just use them to make a miniature vases. Boys can make sail boats from them too (which can really float). They can paint the egg shells and crush them when dried and use them to decorate other crafts such as a Christmas ornament, a jewelry box or a greeting card. They can also make a beautiful and colorful mosaic from these crushed egg shells. It's not just the chicken that comes from the egg. You can make a pig, an Indian, Pinocchio and many other figures from egg shells. You first have to blow the egg out. Hold it over a cup and make a tiny hole in one end with a needle. On the opposite end, make a slightly larger hole. When you blow through the small hole, the inside of the egg will come out the larger hole and fall in the cup so your mother can use it. With colored paper, water color paints and cellophane tape you can make these decorations. Use your imagination and see how many different kinds of egg sculptures you can make. These are a LOT of fun to make. 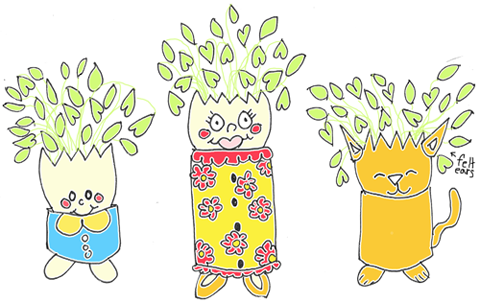 These are sort of like homemade Chia Pets. Get a cardboard tube and cut it down to the height that you want for your guy or animal. Then cut a popsicle stick in half and glue each of them to the bottom of the cardboard tube. Place the cardboard tube on its feet and balance a cleaned up egg shell on the top of the tube. Paint it and decorate it the way that you want...using fabrics, buttons, paints, or whatever. To grow the plant inside of the egg shell...just place cotton inside the empty egg shell (such as from a cotton ball torn up). Then drip some water on the cotton and some cress seeds. Then put it away in a dark closet. Check it out every few days...when you see sprouting grass-like growths...then it is time to take it out. Put it in front of a window and put a few drops of water on the cotton every day. Then the plants will grow and grow and look awesome on top of your characters...just like hair. Ask your Mom or Dad to save you some egg shells. Now break the edges of the egg-shells as evenly as you can. Take a choclate candy box or a cigar box and take the cover off. With the use of a compass or by tracing cups or lids, mark off six circles, just a little smaller than egg-shells. Cut the circles out nicely and then place the cover securely back on the box. Decorate your box with paint or decorate it some other way. Fill the egg shells with fine rich earth or soil. Place the egg-shells in the holders. Now you can place beautiful flowers in the egg shells to grow. Optionally, as an extra touch you can paint the egg shells. 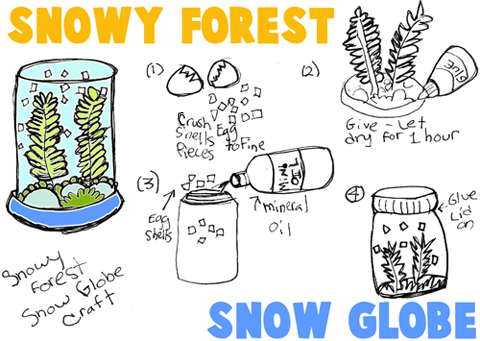 Make a Snow Globe with Real-Looking snow by using egg shells. Crush the egg shells finely by putting them in between wax paper, paper towels, or paper and then beating them with a mallet or like-item...being careful not to damage your parent's counters. Next glue toys, trinkets, or nature items to the bottom of the lid. Allow to dry for at least an hour. Then fill your jar with mineral oil...if you don't have this, use water instead. Then also add the egg shells that you crushed. Then glue the lid onto the jar. Have your parents seal the lid with caulk or hot glue. Then turn it ovber and you have a beautiful snow globe to enjoy forever. You will need an attractively shaped bottle or jar, crushed eggshells (you may dye them if you please), glue, enamel and brush or plastic spray or White Glue watered down a bit, and glitter. Spread glue generously over a section of the jar. Pour eggshells over glue and gently press eggshells in place. Continue this process until jar is covered. Allow to dry. Apply a second coat of eggshells in the same manner. When dry, lightly brush off loose eggshells. Enamel or apply several coats of plastic spray. When dry, add a bit of glue and glitter in various spots. Egg Shell 3 Wise Men or Mary and Joseph - Find out how to make Christmas people such as Mary, Joseph, and the 3 wise men. Egg Shell Flower Baskets - Hang flower planters from your tree's branches...the planters are just hollowed out egg shells and hung with ribbons. These are great for Easter. Egg Shell Gardens - Use your blown egg shells as little planters for your plants or flowers. Put your little garden outside or on your windowsill. Egg Head Animal Faces - Learn how to make blown egg, decorated animal faces. Egg -Head People Faces - Make different character faces out of blown eggs...great for Easter egg decorating. Candied Eggshells Easter Craft - Make a fake bird nest with fake cracked eggs and put it in a tree to fool your friends. Candy Dish with Broken Egg Shells Craft - Here are a few Christmas gifts ideas you can make with inexpensive materials such are shells. Confetti Filled Eggs Easter Craft for Kids - Find out how you can make an Easter egg confetti with a real egg shell. Decoupaged Eggshell Trinket Box Craft Project Ideas for Children - Find out how you can decoupage an old trinket box with eggshells. Decoupage Surprise Window Eggs Craft - Learn how to make an adorable decoupage surprise window egg using a real egg shell. Devilled Easter Egg Chicks Craft for Kids - Turn your hard boiled eggs into cute chicks that are hatching out their eggs. Easter Egg Mosaics Arts & Crafts Project - Recycle left over Easter egg shells into a beautiful Easter egg mosaic. Easter Egg Mosaic Pin Craft Activity - Learn how to make an Easter egg mosaic pin using left over dyed Easter egg shells and a large egg woodies. Easy Egg Shell Candles for Easter or Birthdays - This is an elegant birthday candle you can make for someone special. Egghead Arts & Crafts Project Idea - Find out how you can turn an egg shell into a planter! Eggshell Bouquet Crafts Activity -Make a beautiful bouquet using eggs, white glue, pipe cleaners, tempera paints and brushes. Eggshell Easter Baskets - A cool project that makes a basket that looks like an egg shell. Egg Shell Mosaic Card - Make beautiful eggshell mosaic Easter cards for all your family and friends. Eggshell Mosaics Crafts Ideas - Find out how you can make eggshell mosaics with your kids. Egg Shell Mosaic Crafts Project - Find out how children can make a mosaic from egg shells. Eggshell Mosaic Picture Art - Use your imagination to make a mosaic from leftover colored Easter egg shells. Eggshell Mosaic Picture Craft for Kids - This is a fun Easter craft for children of all ages. Eggshell or Egg Carton Tulips Craft - Learn how to make tulips from eggshell and green pipe cleaners. Eggshell Plant Pots Easter Craft Activity - Make plant pots for Easter using eggshells, potting soil, grass seed and a few other materials. Eggshell Posy Vase Craft for Kids - Make a beautiful vase using half an eggshell, water, glass candle holder, sea glass and a bouquet of small fresh flowers. Eggshell Ships Crafts Activity for Children - Find out how to make a ship from eggs, tissue paper and a toothpick. 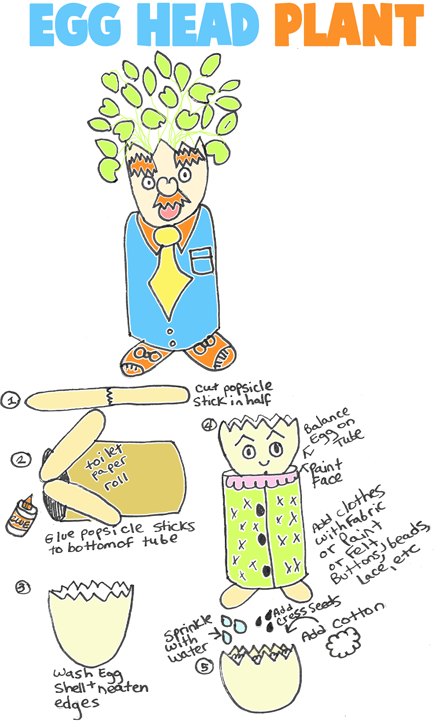 Green-Haired Eggheads Craft Idea - Make green-haired eggheads from empty eggshell halves, waterproof markers, cotton balls, seeds and an egg carton. How To Make An Eggshell Vase Crafts Project - Turn eggshells into beautiful vases in a few steps. How to Make Eggshell Chalk Instructions - Make sidewalk chalk from eggs, hot water and flour. How to Make Eggshell People Activity - Find out how to make cute little eggshell people by following these instructions. How to Make Glass and Egg Shell Christmas Tree Ornaments - Follow these instructions to make beautiful Christmas ornaments from egg shells. Simply Smashing Easter Egg Shells Craft - Decorate your Easter eggs with smashed colored eggshells. Sleepy Bunny Egg Shell Crafts Idea - Find out how children can make this adorable sleepy bunny. Super-Strong Eggshell Arches Science Project - This is a fun and education project for kids. Wobbling Chicken Making Activities - Find out how you can make a wobbling chicken using a real egg!